Why not a single Senate Democrat voted for Betsy DeVos. The Senate made history Tuesday when Mike Pence became the first Vice President to cast the deciding vote for a cabinet nominee. The nominee is now Secretary of Education Betsy DeVos. The vote came after an all-night Senate debate in a futile effort by Democrats to turn the third Republican vote they needed to scuttle the nomination on claims that the long-time education reformer isn’t qualified. Republicans Lisa Murkowski and Susan Collins had already caved, so Mr. Pence had to cast the 51st vote to confirm Mrs. DeVos. She can now get on with her work, but this episode shouldn’t pass without noting what it says about the modern Democratic Party. Why would the entire party apparatus devote weeks of phone calls, emails and advocacy to defeating an education secretary? This isn’t Treasury or Defense. It’s not even a federal department that controls all that much education money, most of which is spent by states and local school districts. Why is Betsy DeVos the one nominee Democrats go all out to defeat? The answer is the cold-blooded reality of union power and money. The National Education Association and the American Federation of Teachers are, along with environmentalists, the most powerful forces in today’s Democratic Party. They elect Democrats, who provide them more jobs and money, which they spend to elect more Democrats, and so on. To keep this political machine going, they need to maintain their monopoly control over public education. Mrs. DeVos isn’t a product of that monopoly system. 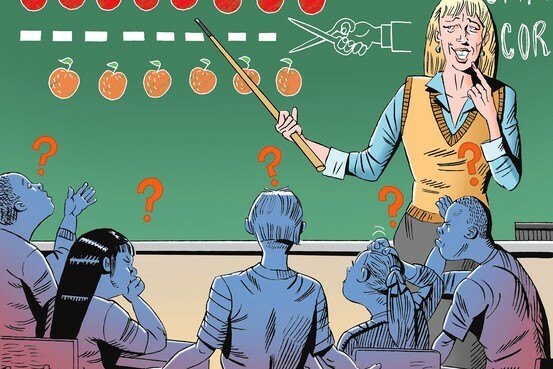 Instead she looked at this system’s results—its student failures and lives doomed to underachievement—and has tried to change it by offering all parents the choice of charter schools and vouchers. Above all, she has exposed that unions and Democrats don’t really believe in their high-minded rhetoric about equal opportunity. They believe in lifetime tenure and getting paid. According to a report in the publication The College Fix, the workshop teaches that Hamas and Fatah — which began as the Palestinian National Liberation Movement founded by Yasser Arafat — promote “more peaceful means than intifada”; that Hamas is a political party, not a terrorist group; that Fatah and Hamas are political parties equivalent to Likud and Labor in Israel; that the use of drones to stop terrorists are like high-tech suicide bombers who kill innocents; that Hamas and Jews have equal claim to Jerusalem; and that the Palestinians have equal claim to land where Israel exists today. The lesson plan has been approved nationally for the Common Core curriculum, The College Fix reports. The program, “Whose Jerusalem?” is offered through the nonprofit “Axis of Hope,” which operates out of the Boston University Global Literary Institute, working with some 25 high schools in various states and three foreign schools, according to The College Fix. And it is Common Core-approved, “despite its bias and serious flaws,” charges Americans for Peace and Tolerance president Charles Jacobs, The College Fix says. The workshop requires students to play the parts of Arab, Israeli, or American leaders negotiating a “best alternative to a negotiated agreement” for the division of Jerusalem. Boston University instructor Carl Hobart, who created the program, insists the classes are simple conflict resolution. But Americans for Peace and Tolerance released a video April 23 aiming to show the program’s anti-Israel slant. Hobart admitted to Al-Jazeera he hopes the exercises will lead students to “put pressure on our government to create a Palestinian state,” The College Fix reports. Common Core is a huge, Progressive educational implementation in New York City which benefits Microsoft and a host of other businesses. Bloomberg is a major supporter of Common Core and strongly believes in it. So, incidentally (or not), does Qatar. One of Bloomberg’s projects is the Fund for Public Schools, whose primary building block is Common Core. In 2013, Bloomberg Philanthropies donated$1,000,000 or more to this endeavor. George Soros and The Open Society Foundations also donated $1,000,000 or more. Qatar Foundation International, LLC donated somewhere between $100,000 and $499,999. The Qatar Foundation donates to educational causes that directly benefit Islam and Qatar. The Qatar Foundation for Education, Science and Community Development is a semi-private chartered, non-profit organization, founded in 1995 by Sheikh Hamad Bin Khalifa Al Thani, the Father Emir (the current Emir is His Highness Sheikh Tamim Bin Hamad Al Thani), and his second wife Mozah bint Nasser Al Missned. In addition to private funding, it is government-supported and partly government-funded. The College Board’s Advanced Placement curriculum on U.S. history must include America’s greatest icons, like Ben Franklin and Martin Luther king, say critics. New history curriculum standards proposed for top high school students leave out such American icons as Benjamin Franklin and Martin Luther King, Jr., paint colonists as bigots and gloss over the Greatest Generation’s fight to save the world from Nazi Germany, according to conservative education activists who want the framework delayed — and perhaps scrapped altogether. Ms. Ratner is professor emerita of mathematics at the University of California at Berkeley. She was awarded the international Ostrowski Prize in 1993 and received the John J. Carty Award from the National Academy of Sciences, of which she is a member, in 1994. I first encountered the Common Core State Standards last fall, when my grandson started sixth grade in a public middle school here in Berkeley, Calif. This was the first year that the Berkeley school district began to implement the standards, and I had heard that a considerable amount of money had been given to states for implementing them. As a mathematician I was intrigued, thinking that there must be something really special about the Common Core. Otherwise, why not adopt the curriculum and the excellent textbooks of highly achieving countries in math instead of putting millions of dollars into creating something new? Reading about the new math standards—outlining what students should be able to learn and understand by each grade—I found hardly any academic mathematicians who could say the standards were higher than the old California standards, which were among the nation’s best. I learned that at the 2010 annual conference of mathematics societies, Bill McCallum, a leading writer of Common Core math standards, said that the new standards “would not be too high” in comparison with other nations where math education excels. Jason Zimba, another lead writer of the mathematics standards, told the Massachusetts Board of Elementary and Secondary Education that the new standards wouldn’t prepare students for colleges to which “most parents aspire” to send their children. I also read that the Common Core offers “fewer standards” but “deeper” and “more rigorous” understanding of math. That there were “fewer standards” became obvious when I saw that they were vastly inferior to the old California standards in rigor, depth and the scope of topics. Many topics—for instance, calculus and pre-calculus, about half of algebra II and parts of geometry—were taken out and many were moved to higher grades. Rabbi Taff, a former president of the Greater Sacramento Board of Rabbis, is the rabbi and spiritual leader of Mosaic Law Congregation in Sacramento. EXCERPT FROM THIS ARTICLE: Earlier this month Rialto officials said they regret the assignment and promised to revise what they said began as an effort to satisfy the Common Core standards. But the acknowledgment of an error in judgment was a long time coming and does not erase the damage. It happened in April 2013 in my hometown of Albany, N.Y., and it happened again this year in Southern California. While the assignments given to Albany High School English classes and to 2,000 eighth-graders at five middle schools in the Rialto Unified School District east of Los Angeles were different, both projects crossed the same dangerous line. A veteran Albany High School teacher gave students an essay to write with the goal of convincing the reader that the writer is a loyal Nazi who hates Jews. “You must argue that Jews are evil, and use solid rationale from government propaganda to convince me of your loyalty to the Third Reich!” In five paragraphs, students were required to prove that Jews were the source of Germany’s problems. Those who defended the assignment—during the public outcry after the story went national—said that it was to teach students how to formulate a persuasive argument. This spring we learned that middle-school teachers in California had given their students a three-day assignment to compose an essay on whether or not they believe the Holocaust was “an actual event in history, or merely a political scheme.” As part of the homework, educators gave students resources including a website that denies the Holocaust. Earlier this month Rialto officials said they regret the assignment and promised to revise what they said began as an effort to satisfy the Common Core standards. But the acknowledgment of an error in judgment was a long time coming and does not erase the damage.